1742 Covens and Mortier Map of West Africa: Guniea, Benin, Morocco, Triopoli. WE SELL ONLY ORIGINAL ANTIQUE MAPS - NOT REPRODUCTIONS JOIN OUR WEEKLY MAILING LIST FOR NEWEST STOCK. Par Guillaume Delisle de l'Academie Royale de Sciences. A Amsterdam Chez Jean Covens et Corneille Mortier, Geographes. Description: This is an excellent example of Jean Covens' and Corneille Mortier's 1742 edition of Guillaume Delisle's influential map of western Africa. This map was issued at the height of the Atlantic Slave Trade. It covers the Barbary Coast and the Kingdoms of Fez, Tunis, and Tripoli (Morocco, Algeria, Tunisia, Libya) on the top to the Gulf of Guinea and the Kingdom of Benin (Nigeria, Cameroon) on the bottom and from the Atlantic Ocean on the left to Niger and Chad on the right. The whole offers extensive detail on the tribes and kingdoms of central and west Africa, noting numerous groups based upon both firsthand accounts from explorers, slave and ivory traders, and missionaries, as well as speculative hearsay picked up by these same groups from the African indigini. Of interest is Delisle's curious mapping of the Niger River, which includes a great lake, called Lac de Guarde or Lac de Sigismes formed by the Niger âÃÃ¬ an embryonic attempt to map the important and unusual Niger Inland Delta. The river, moreover, runs directly eastward rather than correctly to the northeast. Delisle's Niger eventually peters out in the Royaume de Medra rather than correctly turning southwards to rejoin the Atlantic in the Gulf of Guinea. This map also includes the Azores, the Canary Islands, and the Cape Verde Islands. This map was published by Jean Covens and Corneille Mortier in their 1742 edition of Delisle's Atlas Nouveau in Amsterdam. Size: Printed area measures 20 inches high by 25 inches wide. Some countries are duty free, others are not. Additional Services Conservation Framing Services: Geographicus recommends basic conservation framing services for any antique paper. We do not offer this service. The item "1742 Covens and Mortier Map of West Africa Guniea, Benin, Morocco, Triopoli" is in sale since Monday, June 18, 2018. This item is in the category "Antiques\Maps, Atlases & Globes\Africa Maps". 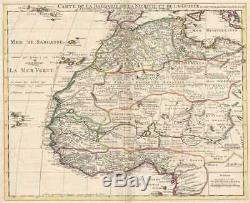 The seller is "geographicusmaps" and is located in 11221. This item can be shipped worldwide.